At Marquez Plumbing, we commit to high-quality replacement. Whether it’s for your kitchen faucet or for your bathroom fixtures, we use only the best products. Cranky faucets can create all kinds of problems for your home. A leaky kitchen faucet may waste a ton of water over time, when neglected. An inconsistent water stream from a bathroom faucet may be inconvenient when you’re having guests over. The sound of dripping faucet anywhere can seem intolerable, especially in the middle of the night. When your home is going through one or more faucet problems, you need licensed plumbers to fix the bathroom and kitchen faucets. At Marquez Plumbing, we do high-quality replacement of all your faucets—from your kitchen to your bathroom. Our skilled plumbers can diagnose the issue and determine the best possible solution and the best parts for the job. 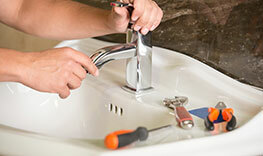 We can work on kitchen sinks, bathroom sinks, bathtubs, showers, laundry rooms, wet bars, and water shut off valves. Before any part is replaced, our licensed and experienced plumbers will figure out the main culprit behind the cranky faucet. Proper diagnosis will enable our professional plumbers to sufficiently fix the problem so you never have to worry about having it redone or going through the same issue ever again. Rusting fixtures could cause the problem. Rusting fixtures will affect the performance of your faucets as well as the quality of tap water. Loss of water pressure is another potential reason for faucet problems. Water pressure may be affected due to mineral deposit build up in your plumbing system. Mechanical issues could be behind clanking faucets. This ensures longevity for your faucets and other fixtures. Backed by years of experience and solid training, our skilled plumbers are able to do every replacement job fast—and right. You can count on the quality and durability of our replacement work. For replacement jobs at odd hours, don’t worry. We can also send our qualified plumbers over to work on your kitchen or bathroom. We are ready and able to serve you 24 hours, seven days a week. Leaky faucets that drip all night. Squeaky faucet handles. Screeching faucets. Inconsistent stream of water. Wear and tear. No matter what the issue is, let us handle it. With our replacement work, you can rest easy knowing your bathroom and kitchen fixtures will perform well and for a long time to come.